Leila Canada, 76, of Belknap, passed away at 7:30 a.m. Monday, March 18, 2019 at Baptist Health in Paducah, Kentucky. Arrangements have been entrusted to Wilson Funeral Home in Karnak. Additional obituary information to follow. Lou Dean Trigg Spurlin, age 76 years, a resident of rural Simpson, Illinois, passed away Sunday afternoon, March 17, 2019, at 2:12 p.m. Funeral arrangements are incomplete at this time at Bailey Funeral Home in Vienna. William Lowell “Willie” Bailey, age 76 years, a resident of rural Simpson, Illinois, passed away Wednesday morning, March 13, 2019, at his home. 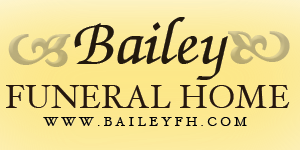 Funeral arrangements are incomplete at this time at Bailey Funeral Home in Vienna and will be posted when available.